Our proprietary upright extraction process preserves the integrity of the source material, producing a pure and clean extract without the use of chemical and solvents. It ensures quality, respect for the environment and sustainability. Tru-Pine™ is a premium quality proprietary blend of Canadian Pine Bark Extract (Pinus strobus), Rose Hips fruit (Rosa canina) and Vitamin C. When combined, they are synergistically enhanced. 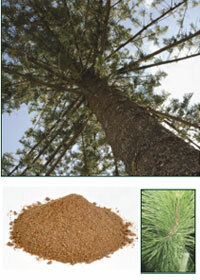 Tru-Pine™ Original Canadian Pine Bark Extract is produced in a cGMP(Good Manufacturing Practice) compliant facility and this unique formula is standardized to ensure consistent quality in every capsule. Nothing compares to the premium quality, purity and freshness of Tru-Pine™ proprietary extract formula.